Luminescent Serum Reviews: Would You Recommend This Product? Luminescent Serum is an anti-aging product that is exclusively available by signing up for a free trial online. There is no information available about the makers of Luminescent Serum. Luminescent Serum must be used day and night for best results, and must always be applied only after a thorough cleanse and tone. Make sure to layer with sunscreen during the day, throughout the full duration of product use, as some ingredients in this product may cause your skin to become more photosensitive or, become more easily damaged when exposed to UV. This product is formulated with collagen which serves as the building blocks of new skin. This product is available via a 15-day free trial offer that allows you to test how your skin reacts and responds to this product without risk, and just by paying approximately US $5 to cover for shipping and handling fees. 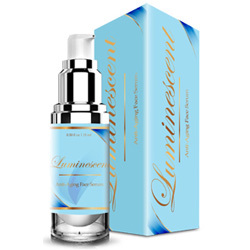 Luminescent anti-aging serum reviews posted on affiliate marketing websites strongly recommend this product for being ably formulated to deliver on claims, although the information is unreliable given that these websites have a vested interest in selling more units of this product to be compensated. The collagen molecules infused in this product has been described as “large”, and you must know that your skin is not very easy to penetrate, and that studies have shown that collagen, when applied topically, must be very tiny to seep through your skin and make it all the way down to your dermis for it to cause visible improvements to your skin. 15 days is too short of a period for you to find out if this product works or not, which makes the free trial practically useless, since even the best anti-aging products take at least 60 days to show the slightest improvements on aging human skin. Luminescent anti-aging serum reviews are severely limited, and many are obviously biased, and therefore do not make good references when you are trying to make a decision about whether or not you should try this product.